We want to design a plugin that will allow us to use regular object and array literals, which will be transformed into persistent data structures using Mori. Let’s get started with MoriScript! If we look beneath the surface of Babel, we’ll find three important tools that handle the majority of the process. The babel-traverse module allows you to explore, analyse and potentially modify the AST. Finally, the babel-generator module is used to turn the transformed AST back into regular code. It’s fundamental that we understand the purpose of an AST before continuing with this tutorial. So let’s dive in to see what they are and why we need them. However, this isn’t very helpful for computers. For them, each of these characters is just a numeric value in memory and they can’t use them to ask high level questions like “How many variables are there in this declaration?”. Instead we need to compromise and find a way to turn our code into something that we can program and computers can understand. A VariableDeclaration with one VariableDeclarator that assigns the Identifier "a" to the NumericLiteral "3". 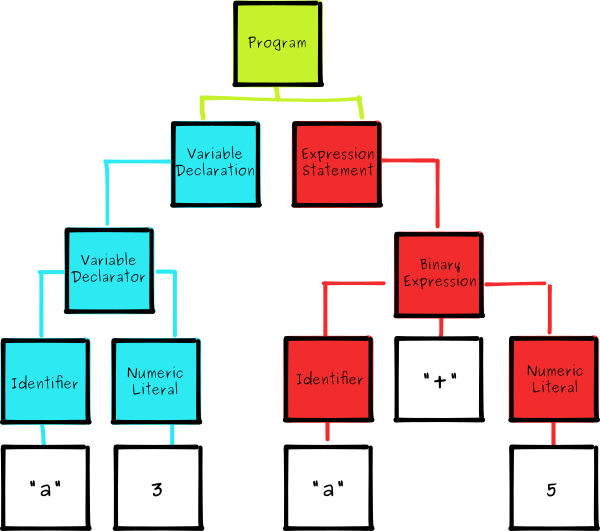 An ExpressionStatement which is in turn is made up of a BinaryExpression, which is described as an Identifier "a", an operator "+" and another NumericLiteral "5". To stay consistent with Babel, make sure you choose “babylon6” as a parser. When writing a Babel plugin, it’s our job to take an AST then insert/move/replace/delete some nodes to create a new AST which can be used to generate code. Make sure you have node and npm installed before you start. Then create a folder for the project, create a package.json file and install the following dev dependencies. Then we’ll create a file for our plugin and inside we’ll export a default function. This function exposes an interface for the visitor pattern, which we’ll come back to later. Finally we’ll create an runner that we can use to test our plugin as we go. The first and foremost goal for MoriScript is to convert Object and Array literals into their Mori counterparts: HashMaps and Vectors. We’ll tackle arrays first, as they’re slightly simpler. Paste the code from above into astexplorer and highlight the array literal [1, 2, 3] to see the corresponding AST nodes. For the sake of readability, we’ll omit the metadata fields that we don’t need to worry about. Now let’s do the same with the call to mori.vector(1, 2, 3). If we express this visually, we’ll get a better sense of what needs to change between the two trees. Now we can see quite clearly that we’ll need to replace the top level expression, but we’ll be able to share the numeric literals between the two trees. Let’s start by adding an ArrayExpression method onto our visitor object. When Babel traverses the AST it looks at each node and if it finds a corresponding method in our plugin’s visitor object, it passes the context into the method, so that we can analyse or manipulate it. 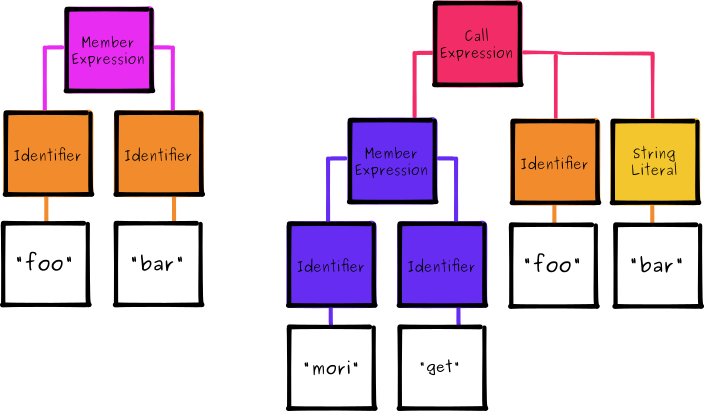 We can find documentation for each type of expression with the babel-types package. In this case we’re going to replace the ArrayExpression with a CallExpression, which we can create with t.callExpression(callee, arguments). The thing we’re going to call is a MemberExpression which we can create with t.memberExpression(object, property). You can also try this out in realtime inside astexplorer by clicking on the “transform” dropdown and selecting “babelv6”. Next let’s take a look at objects. The object literal has a similar structure to the ArrayExpression we saw earlier. This is quite straightforward. There is an array of properties, each with a key and a value. Now let’s highlight the corresponding Mori call to mori.hashMap('bar', 1) and see how that compares. Again, let’s also look at a visual representation of these ASTs. Like before, we have a CallExpression wrapped around a MemberExpression which we can borrow from our array code, but we’ll have to do something a bit more complicated to get the properties and values into a flat array. Finally, we’ll create a helper function for creating the Mori MemberExpressions that we will continue to use. For our new Mori data structures to be effective we’ll also have to override the native syntax for assigning new properties to them. Rather than continue to include the simplified AST we’ll just work with the diagrams and plugin code for now, but feel free to keep running these examples through astexplorer. 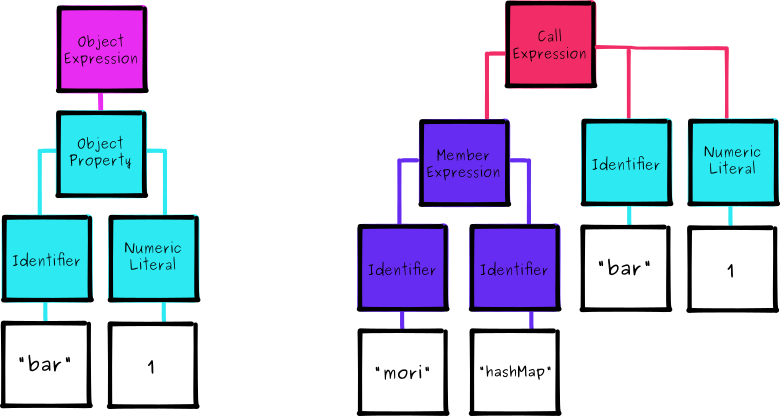 We’ll have to extract and translate nodes from each side of the AssignmentExpression to create the desired CallExpression. Our handler for AssignmentExpressions makes a preliminary check to see whether the expression on the left hand side is a MemberExpression (because we don’t want to mess with stuff like var a = 3). Then we replace the with with a new CallExpression using Mori’s assoc method. Like before, we also have to handle cases where an Identifier is used and convert it into a StringLiteral. Finally, we’ll also have to override the native syntax for accessing a member of an object. Here’s the visual representation for the two ASTs. We can almost use the properties of the MemberExpression directly, however the property section will come as an Identifier, so we’ll need to convert it. The first important difference to note is that we’re exiting the function early if the parent of this node is an AssignmentExpression. This is because we want to let our AssignmentExpression visitor method deal with these cases. This looks fine, but if you run this code, you’ll actually find yourself with a stack overflow error. This is because when we replace a given MemberExpression (foo.bar) we replace it with another one (mori.get). Babel then traverses this new node and passes it back into our visitor method recursively. To get around this we can tag the return values from moriMethod and choose to ignore them in our MemberExpression method. Once it’s been tagged, we can add another return clause to our function. Create a final test case and compile your code to check that it works. If you’re interested in going further and you want to read more about Babel plugins, then checkout the fantastic Babel Handbook and refer to the babel-plugin-hello-world repository on GitHub. Or just read through the source code for any of the 700+ Babel plugins already on npm. There’s also a Yeoman generator for scaffolding out new plugins. Here’s an idea for a novel plugin to get you started. You could abuse the bitwise | OR operator to create functional pipelines like you’d find in F#, Elm and LiveScript. Once you understand the rules, the only limits are the parser and your imagination. Have you made a Babel plugin you want to share? Let me know in the comments.